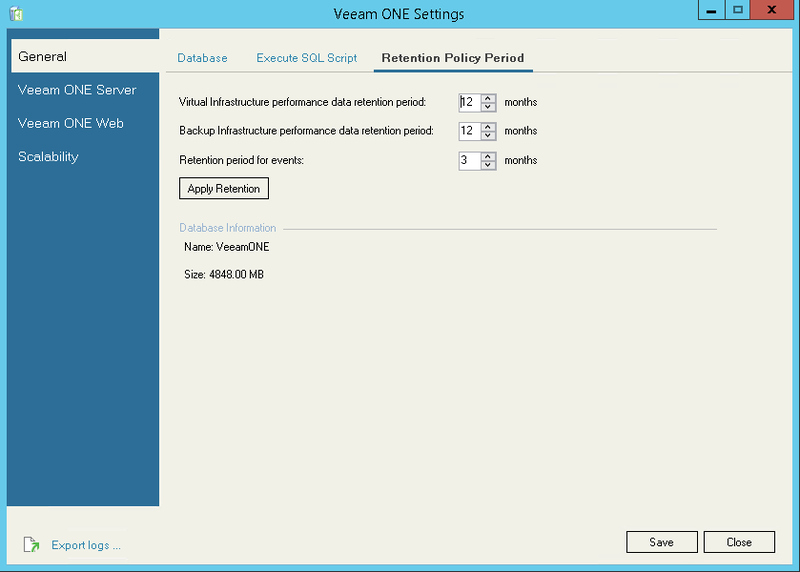 In Veeam ONE Settings utility, review and change retention settings. It is recommended to make the retention period for events 3 months or less, as events data take up a lot of space in the database. The retention period for virtual infrastructure and backup performance data is normally set to 6–12 months. Decreasing the default retention values helps maintain a lower size of the Veeam ONE database, but results in reducing the period for which performance and events data is available in Veeam ONE Monitor and Veeam ONE Reporter. In the menu on the left, click General. Open the Retention Policy tab. Specify for which period virtual infrastructure performance data, backup infrastructure performance data and events data must be stored. In the displayed dialog box, click OK to restart Veeam ONE services.